The Quebec Education Plan is followed, but with 50% more English. We collaborate with specialists such as resource teachers, speech therapists and psychologists. École Marie Gibeau follows the Quebec Education Plan designed by the Ministry of Education, Recreation and Sport. 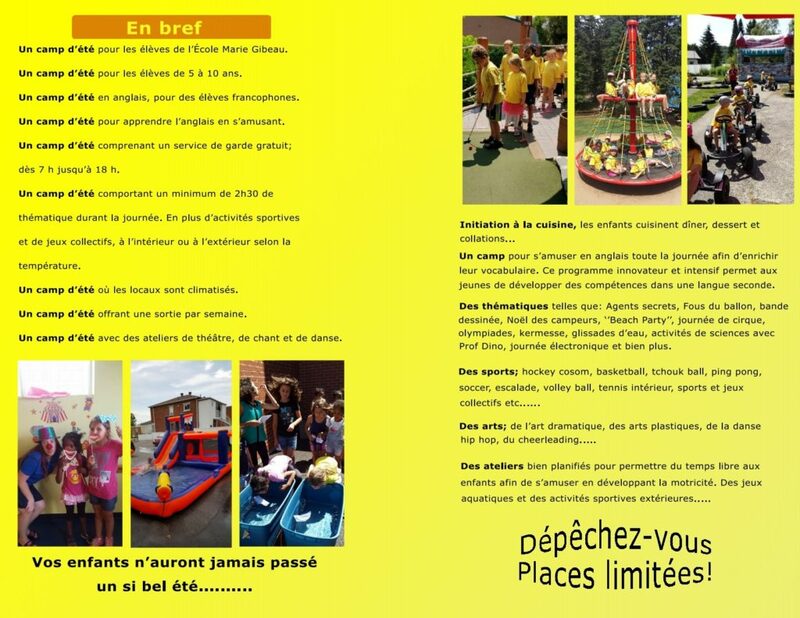 While the program is dispensed in French, it is enriched with 50% more of English classes. All the activities and work are planned carefully to make learning an enjoyable experience for children. With help and encouragement from the teacher, your child will gradually acquire new experiences and master more complex abilities, consequently anchoring his/her confidence. We attach great importance to English as a second language as well as to arts and sports. Balanced and nutritious meals developed with a careful look at Canada’s Food Guide. 5 choices of main courses on a daily basis. Two portion sizes (generous portions). A two-month cyclical menu that varies seasonally and follows various themes. Daily operation adapted to the reality of each school. A constant effort to reduce its ecological footprint. You have the choice to take it on a daily, monthly or occasional basis. No more tears at home over homework! Teachers complete homework with the children in class. The only part that remains is studying. This will help to further the child’s understanding and allow for continuity in his/her schoolwork while decreasing the workload at home. Karate classes take place in the small gymnasium on a weekly basis (one hour). This course is part of the physical education curriculum. A summer camp in English to improve one’s second language while still having fun! 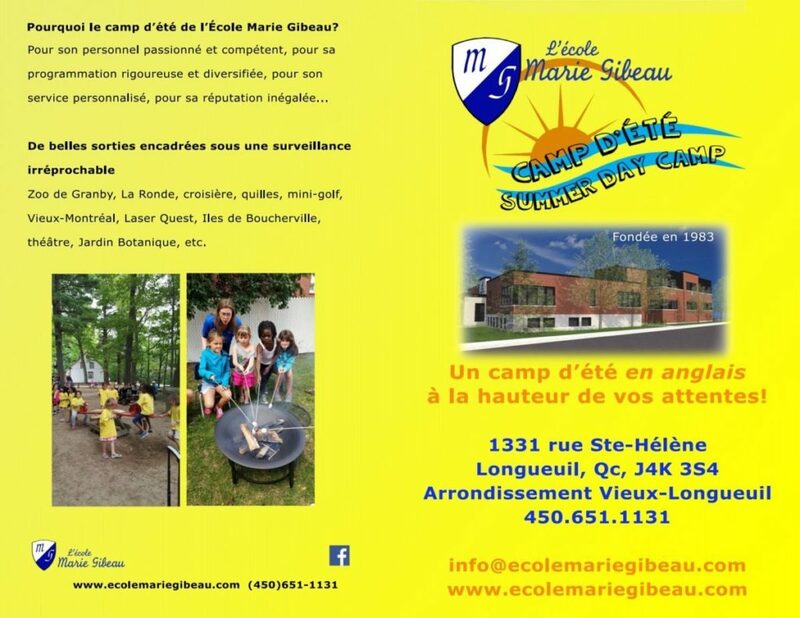 École Marie Gibeau provides you with a list of extracurricular activities to choose from: Soccer, Basketball, Cosom Hockey, Hip-Hop Dance, Cheerleading, Tennis, Piano, Guitar, Volleyball, Ping Pong, Football, Mad Science, Chess, Circus workshop, Fencing, etc. Outside school hours, students at Marie Gibeau have access to a variety of extracurricular activities that suit all tastes. Whether it be in the arts, sports or cultural domain, one can find an additional source of motivation in one’s daily life. Details on extracurricular activities are published at the beginning of each term.